Life is awfully crazy around here, between writing like a fiend (or at least trying to), work on the house before winter and hosting a family get-together on Halloween for Beggar’s Night, The Boy in a soccer tournament, working a full time job, and planning our wedding. We’re in good shape so far on wedding planning, at least in getting things on the calendar and booked. A big thanks to Mom and Sister who made a lot of phone calls for me when I couldn’t because I was at work during the day. More details to come as we firm things up. Sorry for the delay…life is a bit crazy at the moment! Also need to tell everyone that EIGHTH DAY GENESIS: A WORLDBUILDING CODEX FOR WRITERS AND CREATIVES is being sold at a 10% discount from now through November by Alliteration Ink. If you’re planning a novel, or writing a short story, this book has a lot of awesome ideas and suggestions from all kinds of authors, including an essay on legal systems in science fiction and fantasy by ME! Check it out here…http://8thday.alliterationink.com/ and click on Buy It Now…and enter the discount code writenovember to get your discount. I’ve been silent here because there are so many things going on that I wouldn’t know where to start. There’s also a lot of things in the news that make me crazy, but I possess both the right to remain silent, as well as the capacity to know when to keep my trap shut, so I’m being quiet. I’ve written many blog entries, and consigned them to the trash heap corner of my flash drive, where they will likely never see the light of day…and that’s probably for the best. My personal life has gotten a lot busier than normal…but that’s not a topic I generally discuss on the blog. I don’t have any major news to report regarding the writing. According to the conversations I’ve had over email with my publisher/editors, we’re on track to release THE GRIMM LEGACY right on schedule on May 25, 2012. I’m learning real quick about working to deadline…I’ve had a bunch of those lately. And I’ve been learning about my own ability to meet them….as well as being realistic about hitting them without losing my mind. I’ve been talking to people about different things with regard to the release of the book in May, but I don’t have anything to report yet. I CAN tell everyone that I am scheduled to be at MARCon in Columbus, Ohio on April 6-8, 2012, and am scheduled to be on four different panels while I’m there. As usual, there will be someone at the house when I’m not there, and Elizabeth the amazing whiny cat will be on her usual guard patrol. More to come as I get deeper into this process! So I was cranky when I got home from work last night. It wasn’t that I’d had a bad day. Far from it. It had been a strange day, with oddball cases in court, but for the most part, the day had run on schedule. But it was hot. And I don’t just mean shorts and a t-shirt hot. I mean humid and hot, as if I was breathing soup instead of air. I grumbled into the house about having to go out later and water all my flowerbeds and gardens, checked on the goldfish in the pond, and went inside to deal with Velcro-kitty. The cat was GLUED to me. For some reason, beyond my understanding at the time, she was absolutely wigging out. And she wanted to sit rightthere, attached like Velcro to my hip, as I tried to check my email. We’ve been in need of rain for quite some time. It’s so hot that plants are getting scorched in the sun. I decided that I was going to sit down, pay the fuzzy minion some attention, have an adult beverage, and relax, to shake off the cranky-pants mood I was in. And then it began to pour down rain outside, sheeting against the front windows, thunder booming and echoing outside. No wonder the cat was freaking out. She’s terrified of loud storms, and had known it was coming. It rained and poured and there was lightening and thunder. And then I realized I’d forgotten to get the mail. Luckily, the mailbox is on my front porch, which has a roof over it, so I could step outside and get the mail and take a minute or so to watch the storm without getting wet. And then I saw it. It was a package I’d been waiting for. 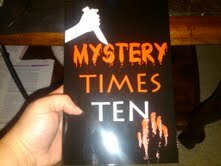 It was my author copies of the anthology coming out this Friday. 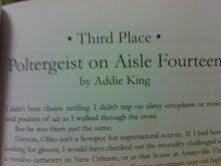 It was the first time I’d seen my own fiction in print, the first time I’d seen my name as a byline under a title of one of my own stories, the very first paid publication credit I’ve gotten. I started grinning. It hasn’t stopped yet, twenty hours later. There is nothing on this earth that jollies one out of a bad mood faster than seeing your own name in print for the first time. I’ve talked before about picking conferences and staying within one’s budget. I’m following my own advice this year; I am staying closer to home than I normally do. In that end, I will not be attending any conferences outside of Ohio this year. As much as I’d love to return to some of the conferences I’ve been to in the past, it’s just smarter this year to stay closer to home. I’m hoping that means that I can do more since I’m spending less. I’m still putting together some of my plans; I might even be able to stay at my own house and commute…which is a big budget saver. I’ll say it here…no, that doesn’t mean that I’m having money problems. It means that I have a house that needs a few updates and a bit of a facelift. I need new carpet. I need new flooring in the bathrooms. I need to fix my dishwasher. There’s a whole list of things that I need to replace. These things mean prioritizing. I’m hoping that getting a head start on house expenses means the ability to travel more next year. As I finalize plans, I’ll post my conference ideas. Where are you planning to go this year?